What is a Teenage Boy? First, a disclaimer: The following has nothing to do with Tommy Edwards the singer. 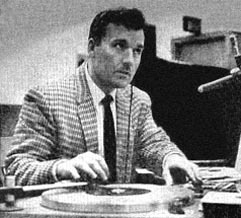 Tommy cannot be connected in any way to the making of the record in question. He was an excellent vocalist and released many fine recordings. This is not one of them. What we have here is one of the classic "bad" records, a real turkey, a priority on the want lists of collectors who love to wallow in the "worst" music of all time (I admit to occasionally falling into this category). 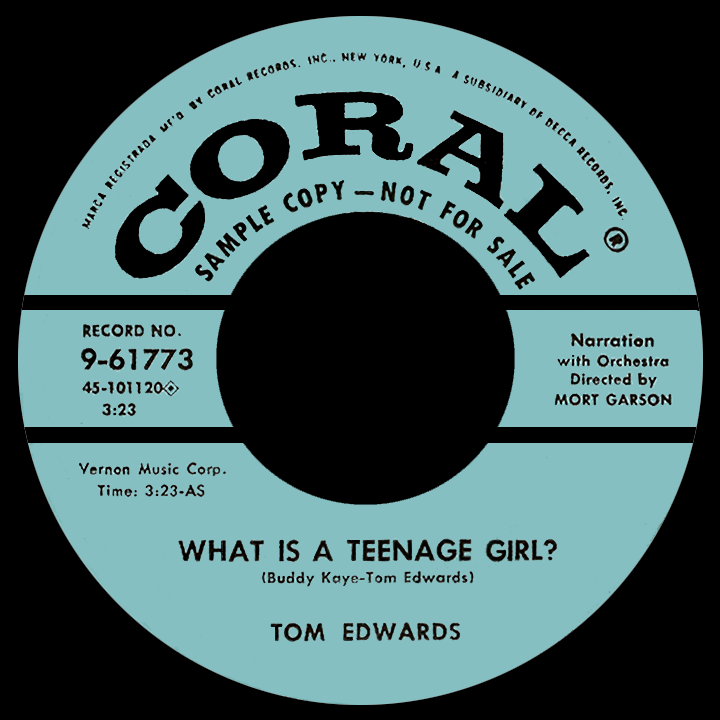 At the time of this single's release in early 1957, Tom Edwards was a disc jockey on WERE radio in Cleveland, a top 40 station, not to be confused with the city's influential station you usually hear about (that would be WJW, where Alan "Moondog" Freed had cut his teeth a few years before). I imagine Coral Records agreed to release the single after he played the thing on WERE, likely after Tom's surprise at not being fired following the initial airing of the two sides (he was safe there - I know from experience that when corny spoken novelty types of records get exposed, the public with its discerning taste usually bombards the station with switchboard-clogging calls to hear it again)! When the single came out, besides the arm-twisting of Decca/Coral promotion reps, he was pushing it himself by sending copies to any progam director or deejay around the country who would give it a spin. Both songs managed to hit Billboard's Hot 100, with the "girl" side making the middle region of the chart. Tom owned a record store in Cleveland called Record Haven, but I believe he opened it later, so it would have been a good place (eventually) to pick up the single in the bargain bin...and put it back down. The teenage girl side ends, inexplicably, with our open-mouth gum chewer playing the latest and loudest rock 'n' roll records, as her mother yells from the kitchen: 'For heaven's sake, will you turn that darn thing off?' The teenage boy side ends with mom yelling from the kitchen again: 'For the last time, you get right down here and take the garbage out!' That's it, just the loving mother appearing abruptly, getting in the final word, quick fade to silence. Everyone really should hear this hokum once in their lifetime. It takes seven minutes to play both sides. That is, unless you value every precious millisecond of time you have on this earth, because it is, after all, seven minutes you'll never get back. On second thought, if you're still with me at the bottom of this page, you've spent too much time on Tom Edwards and his observations on teenagers already.